Welcome to New Jersey National Guard Family Programs Website. As a member of a family who has a husband, wife, father, mother, son, daughter, brother or sister who serves in the National Guard, you face many challenges when that loved on is performing military service. Whether your loved one is serving in support of a military operation overseas or performing training at the local armory, or you simply have a question about your entitlement and benefits, this website is designed to help. Although designed to answer the questions a spouse may have, it can be a valuable source of information for all family members. This website provides an overview of military benefits and how to access them, identifies eligibility requirements associated with some entitlement, and, most importantly, lets you know where you can obtain assistance when you have specific questions and problems. Knowing your benefits and how to access them will help you plan for when your spouse or family member is away performing military service. Because of the geographic dispersion of Guard and Reserve families, it is often difficult to obtain information about your benefits, and in some cases to use them. It may also make it more difficult to access various support services that are normally available at military installations. We are continuously assessing how to improve family support. Technology has allowed us to make many advances, but there is still more that can be done. Rest assured, we want to provide the assistance you need, when you need it. This guide is just one step in that direction. National Guard families must plan to take care of personal affairs early, so that problems do not become an unnecessary crisis during a state emergency, call-up or mobilization. 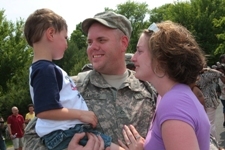 This website will help make soldiers and their families aware of a number of benefits, programs, support organizations and networks available to them. It will also assist in keeping family records updated.